All the info you need can be found here. The top link on the page will take you to the comment form. Since 2006 when the original Southern Resident Killer Whale (SRKW) critical habitat was designated, we have obtained much more data showing how, where, and when these orcas use the outer coast. Our knowledge of coastal habitat use by SRKWs has increased dramatically via NOAA's winter coastal cruises, satellite tagging, acoustic monitoring, and additional well-documented public sightings. I strongly believe these data are sufficient to warrant NOAA accepting the proposed petition and expanding the SRKW critical habitat from the inland waters of Washington to include the proposed range on the outer coast from Cape Flattery, WA to Point Reyes, CA. Endangered species only have a chance at recovery if we consider them in an ecological context, including protection of the entire habitat that makes up their range. Presently, SRKWs only have their core summer habitat protected. It is unreasonable to expect them to recover unless we extend protections to include what we now know are important areas for them for much of the year. Researchers have believed in the importance of the outer coast to SRKWs for decades, and data collected in the last eight years have done nothing but support what we have long suspected. This additional information makes it apparent that the proposed outer coast critical habitat range is essential to the whales' survival and recovery, meeting the ESA definition of critical habitat. 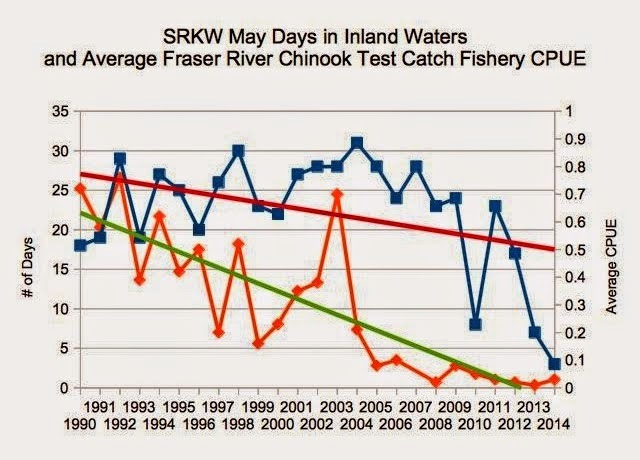 Additionally, in recent years (since about 2007), SRKWs have been spending less time in inland waters, particularly in the spring months (see attached graphs). 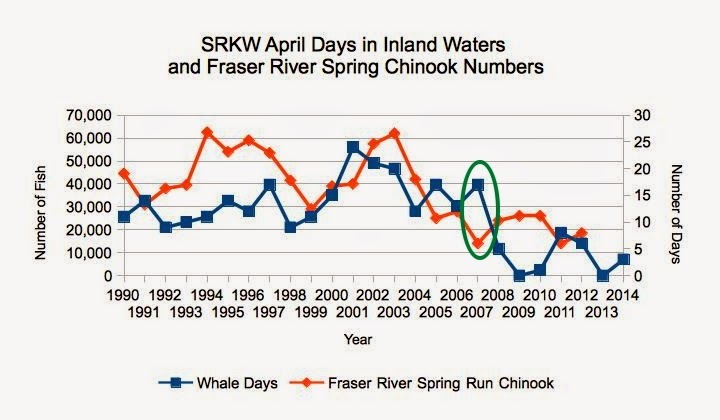 Figure 1 shows a dramatic decline in SRKW visits to the Salish Sea in the month of April, and Figure 2 shows a similar trend for the month of May, both potentially correlated to depressed Chinook salmon spring returns to the Fraser River. Quite simply, if the whales are spending less time in the Salish Sea, their present critical habitat, they are spending more time elsewhere, making it even more important to protect these habitats that are serving an increased importance to them. I hope you will take all the additional data collected into consideration and will make the decision to expand the SRKW critical habitat as proposed in this petition. Figure 1: Number of days Southern Residents were seen in the Salish Sea in the month of April (blue), with data from The Whale Museum's Orca Master data set (1990-2012) and Orca Network sighting reports (2013-2014). Total escapement of Fraser River spring Chinook of both the age-1.3 and age-1.2 runs combined (orange). The Chinook abundance numbers were estimated off graphs in the Pacific Salmon Commission technical reports. Circled in green is where I things seemed to change – in 2007. Figure 2: Number of days Southern Resident Killer Whales were present in the Salish Sea in the month of May (blue) from The Whale Museum's Orca Master data set (1990-2012) and Orca Network reports (2013-2014) with a red trendline. Average catch per unit effort (CPUE) for the month of May for Chinook Salmon on the Fraser River's Albion Test Catch fishery (orange) with a green trendline. Notes on CPUE data: No test catch data available from 2007. 2001 data is from 25 days, 2002 data is from 24 days, all other years are an average of all 31 days of May.